When we began looking at custom equipment for Ladybug a couple of years ago, I never imagined having to search for funding options due to the exorbitant Canadian prices, let alone fighting to get these much-needed items. 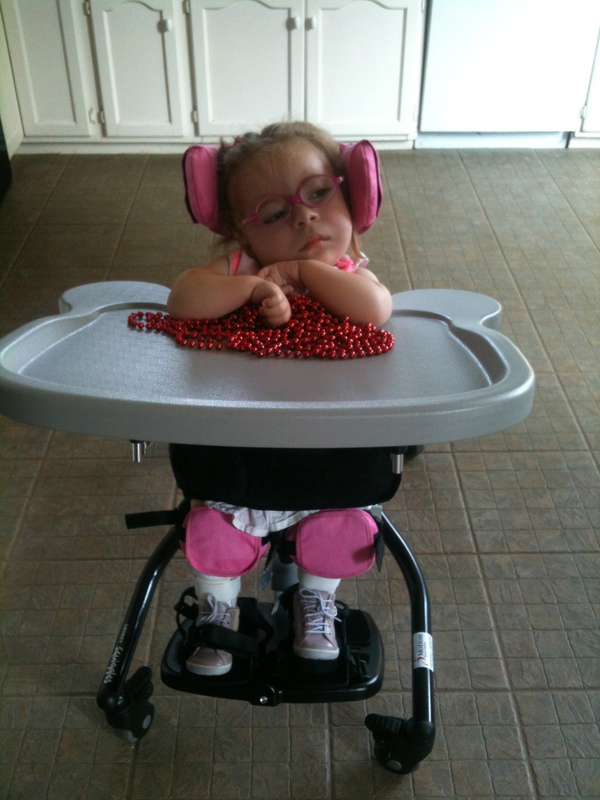 After pushing for over 1 1/2 years Ladybug finally got her custom standing frame last week. One would think that if several specialists state that your child really needs a specific piece of equipment that the supporting team (physiotherapist/occupational therapist) would naturally be on board. I guess I was living in this wonderful medical dream world where when my daughter needs a standing frame we try a few out see how she does and order the one that best suits her. This wasn’t the case – at least not for the first year. Ladybugs support team initially told me that the standing frame would be detrimental to Ladybugs body, and would not be suitable at the time as she was not weight-bearing and had little to no head and trunk control. 4 months later we went to see the orthopaedic surgeon (amazing, amazing, amazing doctor). Again, she asked why Ladybug still didn’t have a standing frame – I explained what the physio/occupational therapy team told me and she proceeded to write a note stating that it is very important not only for muscular development but also bone development that she get a standing frame. This wasn’t just something I woke up one day and said “I think I’ll get Ladybug a standing frame because they look cool and a lot of her CDG friends have them.” I did my research, talked to private physiotherapists, other parents, and ALL of Ladybugs specialists were pushing for her to get one. I’ve come to learn that this is all a part of the system. Everyone flexing their proverbial muscles to see who is the biggest, strongest and smartest. Let me tell you, just because this system exists doesn’t mean you can’t stand up and fight it. You know your child better than any doctor, physiotherapist or occupational therapist. Don’t leave things up to a professional who sees your child a few times a year to tell you what your child can’t do. All they see is what she can’t do. I see Ladybug as what she will do and how I can foster these skills to make things happen. I think my breaking point came when I met with Ladybug’s neurologist who said enough is enough. 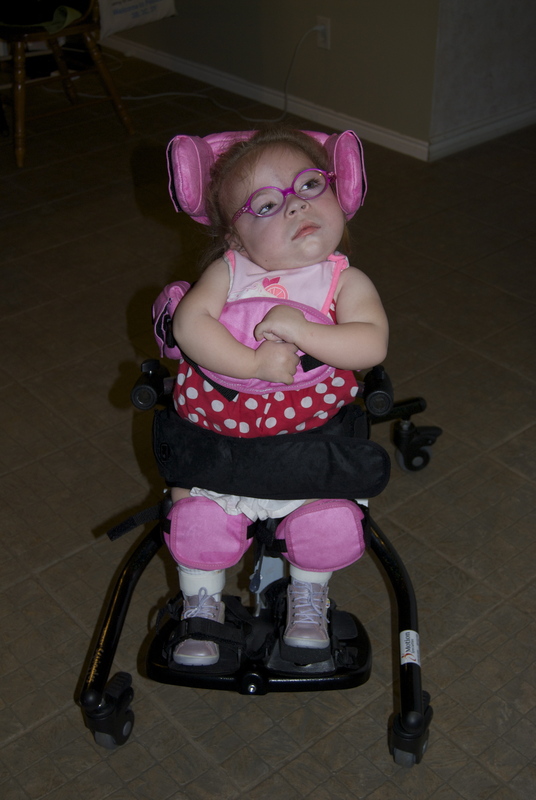 Ladybug needs a standing frame – this is developmentally necessary and it’s obvious that her body and mind want to stand so she needs the tools to help this. I would almost describe my transformation as Incredible Hulk like. I’m not the type of person who enjoys confrontation, that is until it comes to my daughter. Our next physio appointment I came prepared – I brought doctors letters, pictures of children nearly identical to Ladybug in a stander, and statements from other parents saying how much the stander has helped their child. I was not backing down. It was pretty much the same song and dance until there was an agreement to try her in an old “Hannibal Lector” style stander they had sitting in a back room. It was dusted off, Ladybug was put in it, it was raised up and VOILA!!!! Ladybug loved it. She was weight-bearing, had great head control and best of all was the surprised look on the therapists face as she said “She’s doing really well in the standing frame.” I wanted so badly to stomp my feet and say I told you so. But the grown adult in me subtly chuckled inside. I’m certain I had the biggest “I was right” and “I’m so proud of my little princess” smile on my face though. After bringing in a couple new standers for Ladybug to try out, the best fit was the Leckey Squiggles Standing Frame. It’s by the same company as her wheel chair and even came in pink. Ladybug still has a bit of growing in the length department so she can properly use the tray – until then we’ll try to rig something up so she can enjoy playing while standing. I don’t think it matters to her though, she absolutely loves being in the standing frame. I’m certain with time more and more milestones will be reached, all because I didn’t back down and in the end had the strongest muscles to fight the system. I first found your blog when my daughter got her Leckey Squiggles Chair and I had googled pictures of it to show my boss. We too have the same stander and love it. When we got K’s the supplier said that the hip laterals and tray support can be switched so that the tray is mounted lower. It’s not a simple change as it does involve a bit of disassembly of the stander, but it can be done. So happy you were finally able to get the stander for her.